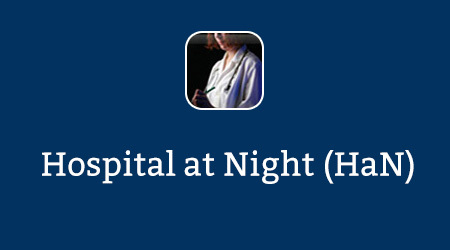 Hospital at Night (HaN) is a web-based resource targeted at HaN multidisciplinary teams. It has been developed by Health Education England e-Learning for Healthcare in collaboration with Skills for Health Workforce Projects Team (WPT) and London Deanery’s Simulation and Technology-enhanced Learning Initiative (STeLI). The project is further supported by the Royal College of Physicians and the Royal College of Nursing. HaN is intended to be a key component of London Deanery’s and WPT’s overall vision to make HaN a mainstream component of the delivery of safe and effective clinical care to patients throughout the NHS. It will support the training of junior doctors, particularly those in foundation and core training programmes, and nursing staff, while providing a resource for others, such as consultant and managerial staff, involved in the delivery and support of out of hours care. The Hospitals at Night (HaN) concept (as opposed to the HaN elearning programme) was initially developed as a response to the problems posed by the European Working Time Directive (EWTD). The focus of the HaN concept is to provide safer clinical care in the out of hours setting through one or more multi-professional teams who have the full range of skills and competences to meet the immediate needs of patients. It also supports better learning opportunities for doctors in training. The HaN programme was initiated by the Department of Health and London Deanery and piloted by the Modernisation Agency in 2004. Skills for Health WPT have led, in conjunction with the London Deanery, the implementation of HaN across the NHS since 2005, with the support of the Royal Colleges of the medical specialties and nursing and other professional organizations. Pilots of Hospital at Night at several sites have been highly successful and more comprehensive research into the impact of Hospital at Night (‘The Case for Hospital at Night’) demonstrated improvements in patient safety and care, as well as suggesting an increase in overall hospital efficiency. 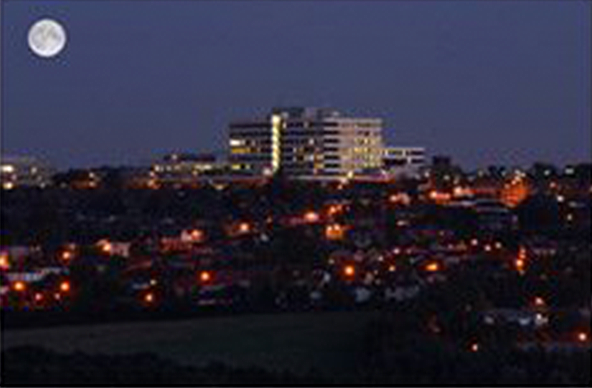 Resources have been developed for Trusts to implement Hospital at Night, including the comprehensive guide, ‘Making Hospital at Night Mainstream’. The concept is being implemented in Australia, New Zealand and Hong Kong with a number of other countries’ health services considering implementation. They too may see the need for H@N e-learning training in the future. If you already have an account with e-LfH, then you can enrol on to the Hospital at Night programme by logging in to the e-LfH Hub, selecting My Account > Enrolment and selecting the programme. You can then access the programme immediately in the My e-Learning section. The Hospital at Night programme is also available to NHS healthcare staff via the Electronic Staff Record (ESR). Accessing this e-Learning via ESR means that your completions will transfer with you throughout your NHS career.